Halloween Horror Nights is back and better than EVER! I have had the pleasure of attending HHN for the past 3 years and I can honestly say it never gets old. Each year Universal Orlando goes Bigger and more scarier with each house. You will never know what you can expect until you are actually walking through one of the houses. It’s crazy fun. This years Halloween Horror Nights 26 featured 9 houses, 5 scare zones and 2 CRAZY fun live shows. My husband and I were lucky enough to get to attend Halloween Horror Nights 26 courtesy of Universal Orlando. We look forward to seeing how much better Halloween Horror Nights gets each year. After last year I didn’t think that HHN could get any better but once again Universal Orlando proved me wrong. This year was fantastic and well worth the year long wait. What Can You Expect at Halloween Horror Nights 26? In total there are 9 different houses. Each house has it’s own theme. Wait times can vary from house to house and the more popular ones tend to get longer lines faster. I would highly recommend doing these houses first, or towards the end of the evening to avoid being in a really long line. Here are the 9 houses and my thoughts on each of them. It took me months until I could get up the courage to watch Krampus. I mean there is just something not right about a cheerful holiday movie mixed in with a demon. 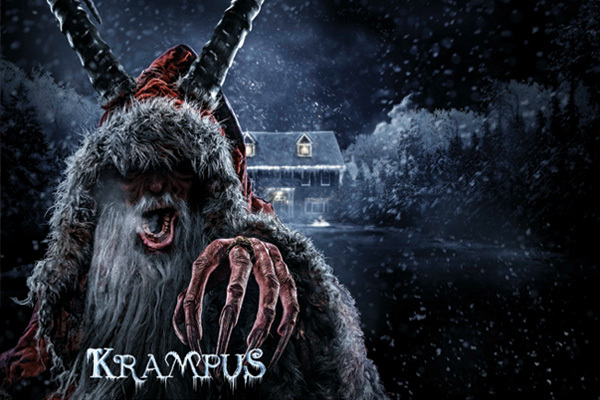 Christmas is suppose to be happy, but for all those who lose the Christmas spirit, Krampus will be waiting. The Krampus house was definitely one of my favorites. Universal Orlando went into great detail in this house and it definitely shows. They are very true to the movie in this house from the kitchen scene with the creepy little gingerbread demons to Krampus himself standing on the roof watching you. It is a great house and one of the scariest. This house was by far my favorite! I am a really big fan of American Horror Story so it was fun being able to watch some of these characters and iconic scenes come to life. This house was probably the longest walk through of all the houses this year. I would estimate it took us about 4 1/2 minutes from entrance to exit to get through it. Well worth the wait, in my opinion. The American Horror Story house features scenes from all 5 seasons of American Horror Story. And yes you will see Twisty the clown, Actually you’ll see him several times so be prepared. I was able to shoot a few scenes from this house. You can view it below. LOVED this house! The detail and time it went into making this house was apparent as you walked through each of the scenes. It’s like you are transported back into the wild west. There is even a scene in the saloon which is incredible and probably one of my favorite scenes from all the houses I’ve been in at HHN. And the scare actors are amazing. Honestly they really hired some great talent this year. I’m not going to lie, I really did not want to go through this house. I watched this movie as a kid and it scarred me for life. Even at 35 years old I still get chills thinking about it. So as we walked through the house I had reservations about how scary it was going to be. And it was scary. All of the scenes through the house were iconic scenes from the movie…Pea Soup anyone? 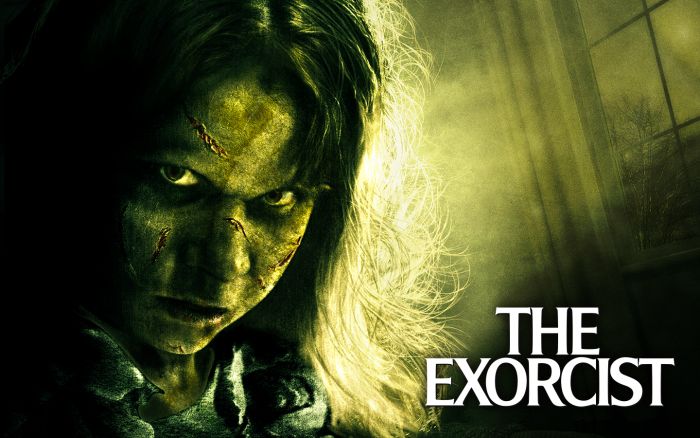 I managed to survive the Exorcist house but I am not sure I could do it again. It gave me chills and scared me so bad that I said a prayer afterwards. So if you are looking for scare factor, this is your house. 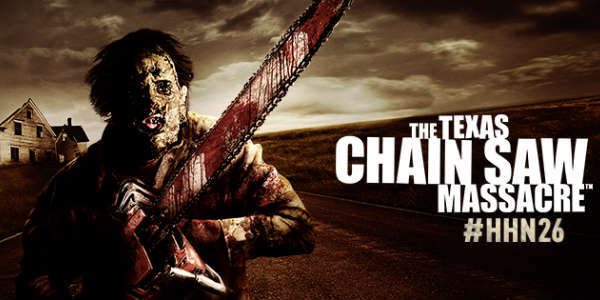 There is something extremely terrifying about a man in a leather face, with a chainsaw coming straight at you. Now imagine that happening over and over and over again. That’s what you’ll experience in the Texas Chainsaw Massacre house. And I have to add that the scare actors that they hired to play Leatherface where HUGE! I mean they must have been walking on stilts to be that tall. While this wasn’t one of my favorite houses, it still did it’s job in scaring me. Tip: When you walk through this house make sure you check out all of the details like the pictures hanging on the walls, and knick-knacks on the tables. It’s really incredible the detail that you’ll find. In 2014, Halloween was brought to life in the iconic house from the original movie. From the moment you walk up to the house you start hearing that bone chilling music that we all know and love. This year Halloween Horror Night picks it up where Halloween 1 left off. You can view the video below for a Walk-Through of all the best highlights of the house. As a huge fan of The Walking Dead, I always look forward to going through this house. The years before they have focused on one season but this year they picked out important scenes from each of the seasons, so you’ll get a taste of all of them. I really loved this! You’ve got the prison, Terminus, and even a scary moment where you have to make your way through what seems like hundreds of walkers. Probably more like 10-20 but with all the flashing lights it really seems like much more. Whether your a fan of the show or not, you will enjoy this house. While I am normally not a big fan of 3D houses (I get motion sickness really easily) this one was pretty fantastic. There is so much going on that you will be looking in all directions at once. I am guessing that this house is meant to disorient you somewhat so that it will add to the thrill factor. It definitely does. 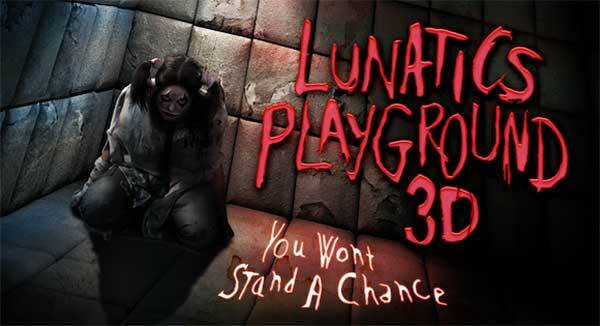 The whole concept surrounding this house is based on Chance and how she escapes her captors. But she doesn’t just escape she gets her evil revenge. There is always one house that surprises me and blows me away. This house definitely falls into that category. I wasn’t really sure what to expect in this house and that’s sort of the point. This isn’t your typical scare house where you know people will be popping out. There are surprises around every corner that’ll make even the not so jumpy person jump. (Just ask my husband). Again, the detail of this house was incredible. You really feel as if you are walking inside of a tomb that’s been hidden for centuries. There are even a few tight spaces that add to the fear factor. I would recommend this house being one of your top choices to walk through. Halloween Horror Nights 26 had 5 scare zones spread throughout the park. These included: Survive or Die Apocalypse, Lair of the Banshees, Dead Man’s Wharf, Vamp 55 and a Chance in Hell. I love the scare zones! But my two favorites this year were Dead Man’s Wharf and Lair of the Banshees. Both of these zones were super detailed and pretty creepy. 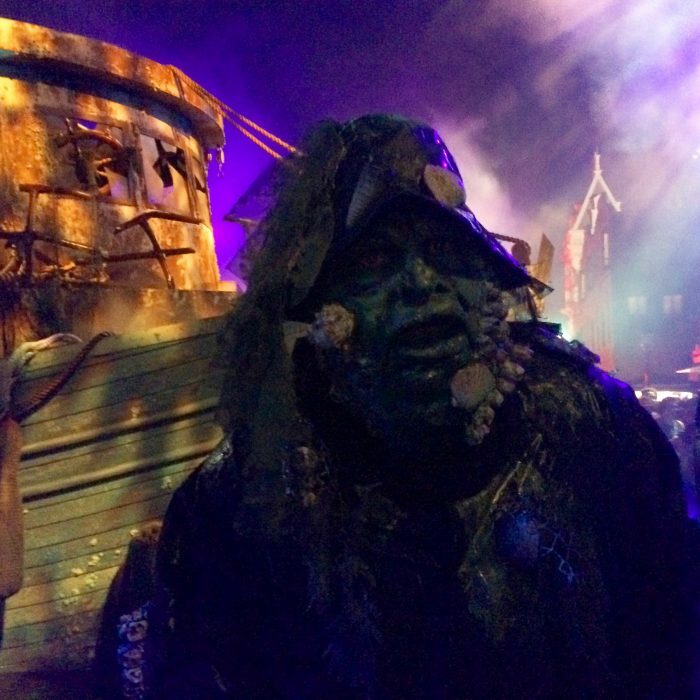 And last but not least the two very incredible live shows featured this year at Halloween Horror Nights 26. 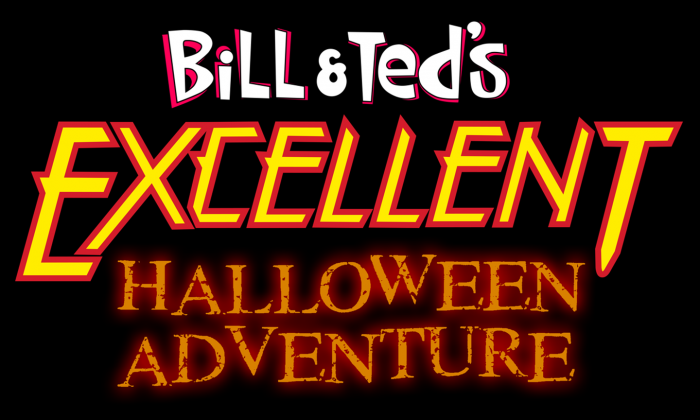 Of course there is Bill and Ted’s Excellent Halloween Adventure, a fan favorite. This show features a mixture of comedy, scantily dressed men and women and pop culture. You don’t want to miss it. The next show is Academy of Villains: House of Fear. While I didn’t personally have time to visit this show I have heard great things. Each and every year Universal Orlando goes above and beyond when it comes to HHN and this year is no exception. I thought the houses were amazing! The detail and most importantly the lengths of the houses has improved so much. I would estimate that the average length of the HHN26 houses were about 3-4 minutes each. So you get your money’s worth. Overall we had an amazing time and I can’t wait to do it again next year. For more information on Halloween Horror Nights 26 including dates and ticket prices you can visit Halloween Horror Nights 26 to learn more. 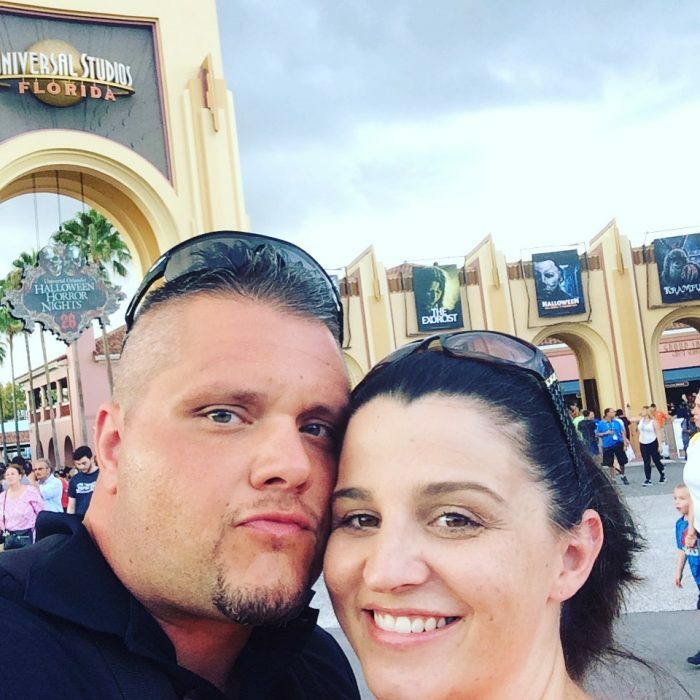 Universal Orlando covered my travel, hotel and tickets to HHN. All opinions expressed are my own. I love haunted houses and like when they go in great detail. All of these sound awesome. I’d be stoked to go in them. Too bad I live so far away.